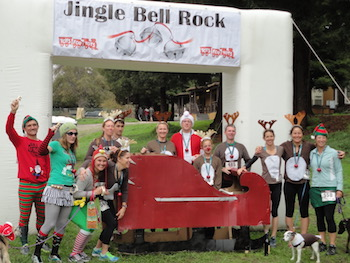 Register for the Jingle Bell Rock today! Additional race information can be found at http://www.finishlineproduction.com/. Come and join our annual year end holiday event! Its all about the toys and the fun. Put a smile on a child's face for a REALLY great cause. 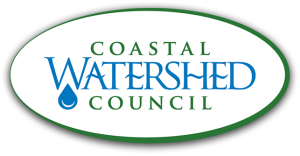 Bring a toy for Toys for Tots, go for a walk or run along the San Lorenzo River Levee. You can choose either 5K or 10K to run or walk, the kid's 1K for kids 10 and under. This is the 11th year for Jingle Bell Rock and each year as the participation grows we try to set a big goal for collecting toys. Our goal for this year is 1000 toys. All the collected toys stay in our community. Kid's 1K will start at 9:00am, and this year it will be timed with the top 3 boys and girls under 10 receiving special recognition. Each participant in the 1K will receive a jingle bell as a finisher's award. Suggested for Kids 10 and under. The 5K and 10K will be timed and start at approximately 9:15 after the 1K finishes. Runners will line up and go first, followed by the walkers. If you have a stroller we ask that you position yourself appropriately for the run or the walk. 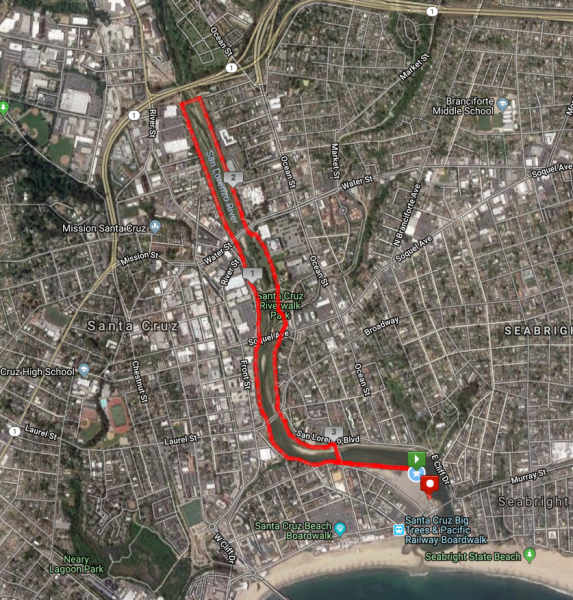 The 10K is two loops and the 5 K is one loop, starting and ending at the Santa Cruz Beach Boardwalk in Santa Cruz. We'll have prizes for the best dressed runner who comes decked out in holiday running wear, the best dressed team, the best holiday ugly sweater, and the best decorated stroller runners, and the best dressed canine running companion costume. We'll also do an award for the best volunteer outfits or team of volunteers! Get busy and get creative. See you at the Jingle Bell Rock. We are so proud to be able to participate in this program, not just for the toys that are donated in our community, but for the literacy project as well. 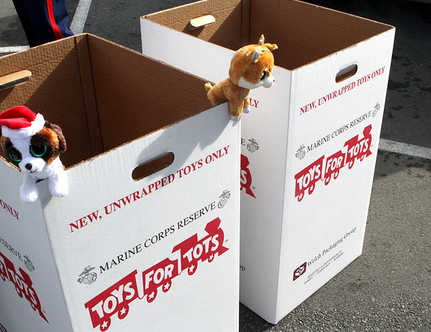 The Marine Toys for Tots Program collected and distributed 18 million toys to 7 million less fortunate children in this past year allowing them to experience the joy of Christmas and receive a message of hope that otherwise would not have been there. This community action program took place in 792 communities covering all 50 States, the District of Columbia, Puerto Rico, and the Virgin Islands. 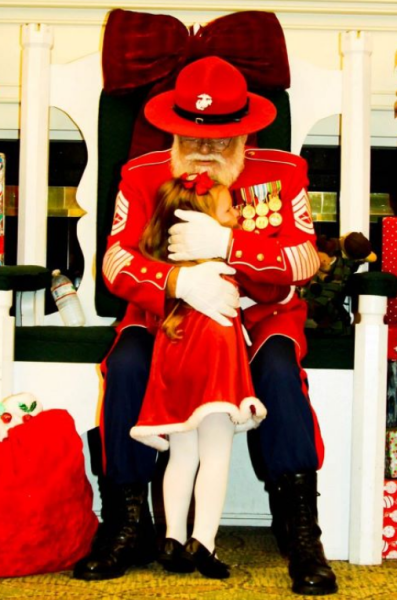 The Toys for Tots Literacy Program helped bring the gift of reading to less fortunate children across the nation. The Foundation in concert with The UPS Stores raised over $454,802 through donations at over 2000 UPS Stores locations. The funds raised were used to purchase quality children’s books, which together with other donated new books, allowed the Foundation to distribute over 1.5 million books to less fortunate children and to schools located in depressed areas. The 5K and 10K course map will follow a complete loop of the Riverwalk Levee Trail. 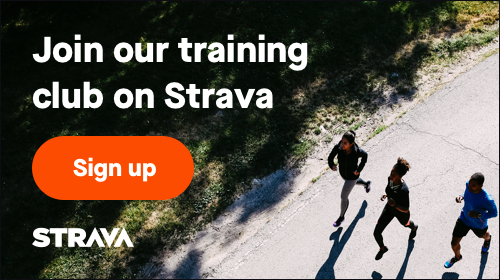 This course is completely closed to traffic and there are no street crossings. Runners will start on the levee trail next to the Santa Cruz Beach Boardwalk. 5K Runners will make one loop of the trail and return to the finish line after crossing the Riverside Street Bridge for a complete distance of 3.4 miles tot he finish. 10K runners will make a second loop after crossing the Riverside Street Bridge before proceeding to the finish. Click on the course title to be taken to the Map My Run link for the course. The Kid's 1K course is an out and back along the trail. The kid's course will be timed this year. If you can't make it to the race and still want to contribute a toy you can drop one off at any of these local businesses supporting Jingle Bell Rock. 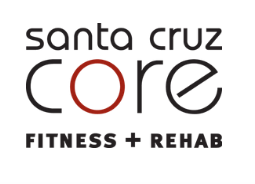 Fleet Feet Aptos, 7960 Soquel Drive - Suite1, Aptos NOTE: this is a new location. Let's fill up those boxes! We'll have prizes for the best dressed runner who comes decked out in holiday running wear, the best dressed team, the ugliest holiday sweater, and the best decorated stroller runners!